Since the kids have the DS Lite (previous generation) versions, it's kinda cool to see what upgrades and new features Nintendo stuffed into the new model. - The DSi has an integrated SD/SDHC expansion slot. files and external storage of pictures or downloaded software. Can anyone say homebrew apps? - Samsung 1st generation MoviNAND KMAPF0000M: 256 MB NAND Flash and MMC controller. - 82DBS08164D-70L: Fujitsu Ltd 128-bit FCRAM (fast-cycle RAM). 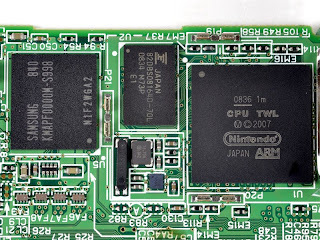 - Nintendo's custom ARM CPU. 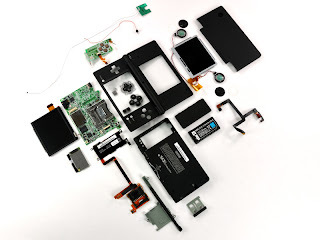 The full step by step teardown report is here.